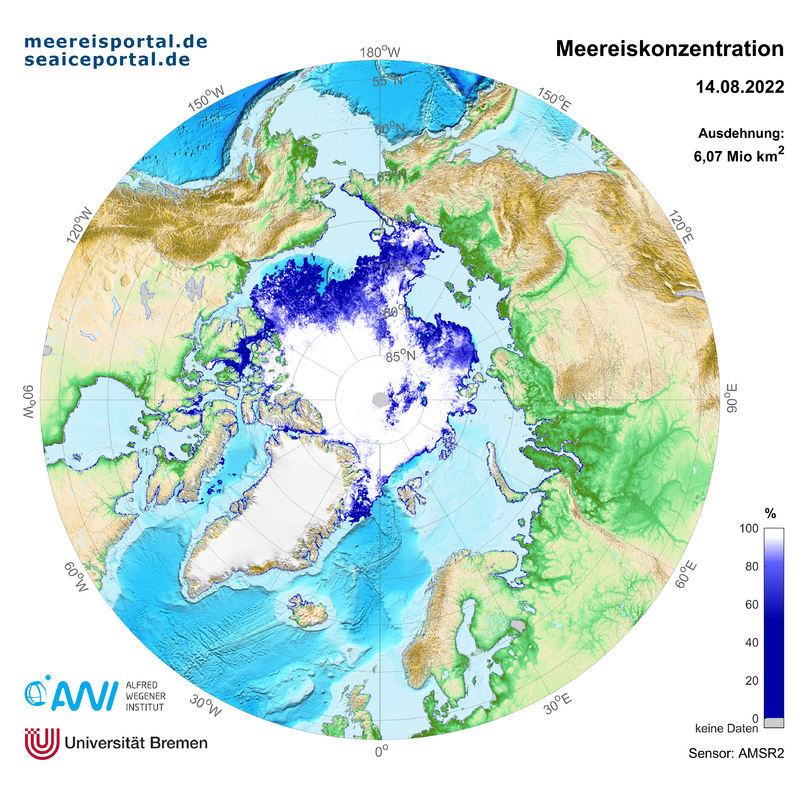 The data and image archive of meereisportal.de provides sea ice data of the Arctic and Antarctic. In addition to graphic representations of the underlying verified data and derived data products it is also possible to download the information for further processing. The selection menu allows an adequate filtering of all map and data information stored in the archive. The navigation in the selection menu is orientated from left to right. It is not possible to offer data for all regions and all temporal resolutions. Thus, only the available choices for the selected combinations are shown. The sea ice data offered is always the latest version available. Enhancements are in constant progress and updates are highlighted. Additional near real time data in the Arctic region can be found at . In case of questions or any difficulties, please contact us at: info@meereisportal.de. Here you find all sea ice data that has been collected from different aircraft based measurements in the data base PANGAEA since 1995. The sea ice data is organized in tabular form and distinguished by measurement method (AEM: Airborne Electromagnetic Measurement, LiDAR: Light detection and ranging). There is no antarctic data available. Buoys, or more generally speaking "ice tethered platforms" that perform autonomous measurements of physical properties of sea ice, snow, and the uppermost ocean are one of the main instruments to collect time-series data sets from the remote polar regions. Here we present data, metadata, and results from our buoys drifting on Arctic and Antarctic sea ice. International Program on Antarctic Buoys (IPAB): http://www.ipab.aq/ (note that this page is currently under revision for updates). Note: If you are aware of other buoy data collections, please send us a message, we would be happy to link them here, too. Here you find all sea ice data that has been collected from different manual measurements in the data base PANGAEA since 1991. The sea ice data is organized in tabular form and distinguished by measurement method (in-situ, radiation, standardized visual observation ASPeCT /ASSIST). This data set consists of moored Upward Looking Sonar (ULS) data from 14 stations in the Weddell Sea. Parameters in the processed data files are water pressure, water temperature, draft, and a flag to indicate if the instrument is situated under ice. Raw data files contain additional parameters. These data were contributed by the Alfred Wegener Institute, Helmholtz Centre for Polar and Marine Research, Bremerhaven, Germany, in 1999. Data are available via FTP. understand some of the factors that cause differences in model projections, including quantifying some key feedbacks such as those involving clouds and the carbon cycle. This page collects the output of 34 climate models, providing projections of sea ice concentration in the Arctic and Antarctic regions for the period 2010-2100. In particular, the sea ice concentration has been averaged over three time slices of 30 years each: 2010-2039, 2040-2069 and 2070-2099. The maps are available for the months of February, when sea ice extent and area are near its maximum in the Arctic and minimum in the Antarctic, and September, when sea ice extent and area are minimum in the Arctic and maximum in the Antarctic. This selection is performed in accordance with IPCC 2013 . The projections are formulated for three different RCP (Representative Concentration Pathways) scenarios. These are three greenhouse gas concentration trajectories adopted in the fifth IPCC Assessment Report (AR5), in 2013. The three RCPs, RCP2.6, RCP4.5 and RCP8.5, are named according to the increase of radiative forcing from anthropogenic emissions of well-mixed greenhouse gases in the year 2100 relative to pre-industrial values (+2.6, +4.5, and +8.5 W/m2, respectively). For each map, the sea ice extent and area are included. Furthermore, the observed reference climatological sea ice extent line (15%) is mapped for the period 1981-2010 (NSIDC). This allows an immediate visual comparison of the modelled state with the current sea ice condition. 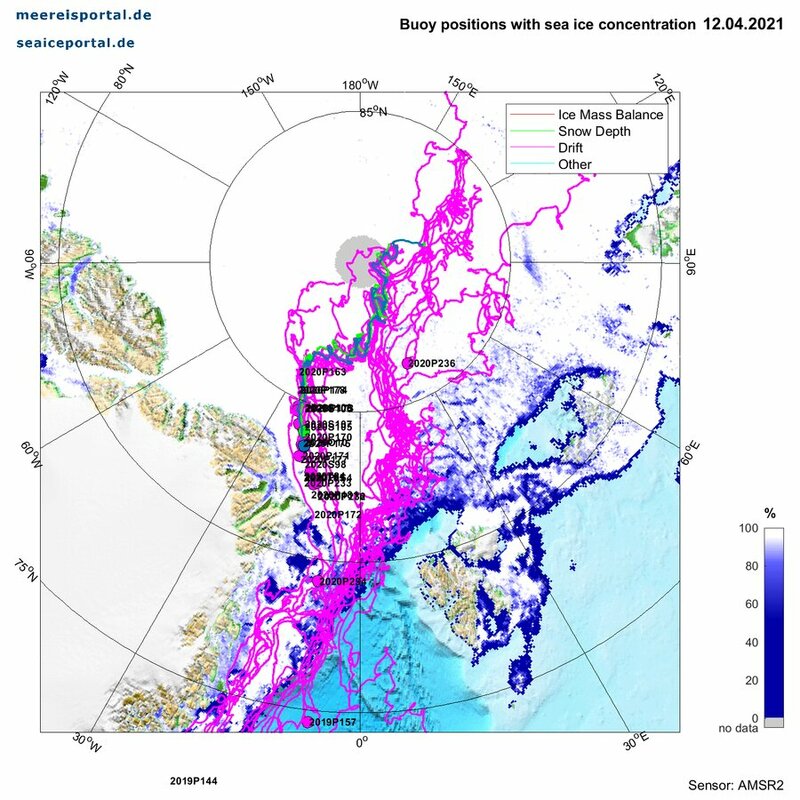 The 15% contour line of the modelled sea-ice concentration field is also drawn in the maps. The models differ both, in their complexity and in their spatial resolution. For this reason, the model results differ sometimes substantially. However, a transition towards a September ice-free Arctic for the highest-emission scenario RCP 8.5 occurs across all the models . Most of the maps show a sea ice concentration which is the average of different model runs (ensemble members), for the same RCP scenario. The number of the ensemble members is reported underneath the color bar, together with the model name. A complete documentation for the models can be found at the es-doc (Earth System Documentation), including references.Specifically, use the following search criteria Project/MIP Era: CMIP5, Document Type: Model. The models ACCESS1.0, ACCESS1.3, BNU-ESM, GFDL-CM3 and GFDL-ESM2M are interpolated to a regular lon/lat grid, for visualization purposes. The land masks for the models CanESM2, CSIRO-MK3.6.0 and EC-EARTH are not perfectly matching the sea ice concentration variable. However, these were the best land masks available for these models. The maps related to the models CSIRO-MK3.6.0, GISS-E2-H, GISS-E2-H-CC, GISS-E2-R and GISS-E2-R-CC do not include the 15% contour line of the model. R. Moss, M. Babiker, S. Brinkman, E. Calvo, T. Carter, J. Edmonds, I. Elgizouli, S. Emori, L. Erda, K. Hibbard, R. Jones, M. Kainuma, J. Kelleher, J. F. Lamarque, M. Manning, B. Matthews, J. Meehl, L. Meyer, J. Mitchell, N. Nakicenovic, B. O’Neill, R. Pichs, K. Riahi, S. Rose, P. Runci, R. Stouffer, D. van Vuuren, J. Weyant, T. Wilbanks, J. P. van Ypersele and M. Zurek (2008). Towards New Scenarios for Analysis of Emissions, Climate Change, Impacts, and Response Strategies (PDF). Geneva: Intergovernmental Panel on Climate Change. p. 132. J. Weyant, C. Azar, M. Kainuma, J. Kejun, N. Nakicenovic, P.R. Shukla, E. La Rovere and Gary Yohe (2009). Report of 2.6 Versus 2.9 Watts/m2 RCPP Evaluation Panel (PDF). Geneva, Switzerland: IPCC Secretariat. There are different methods to measure sea ice. This area of the data portal is structured accordingly. 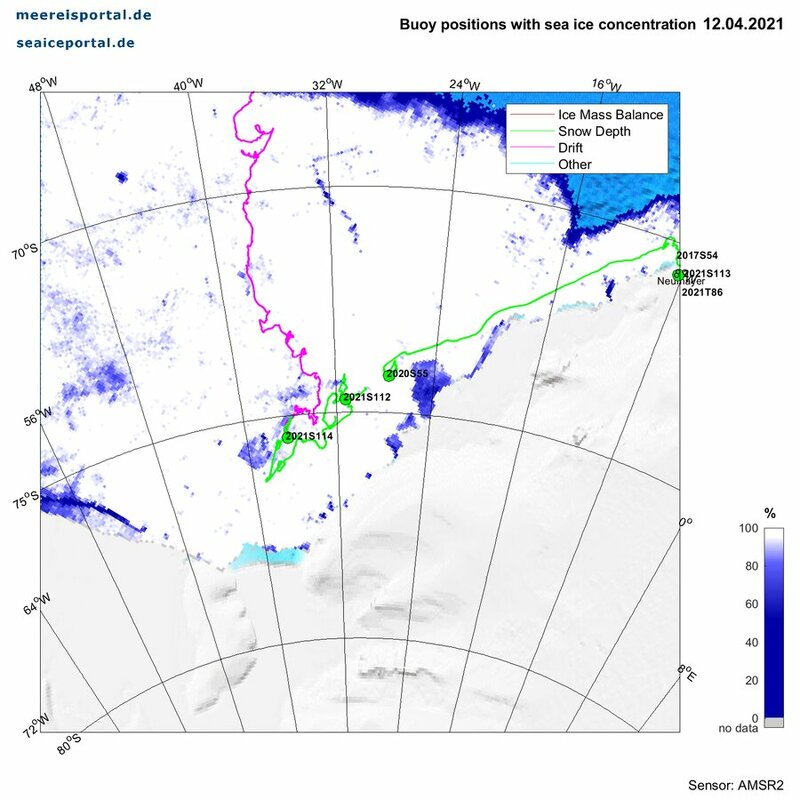 The sea ice data is organized by the different methods which can be accessed via the upper navigation bar. Satellite measurements such as CryoSat-2, SMOS und AMSR2, aircraft based measurements (airborne data) as well as autonomous measurements from different buoys range among the methods. Furthermore, the data portal offers a list of manual measurement data (manual measurement) for the time period from 1991 to today from the data base PANGAEA. Moreover, the website offers the download of echosounder data from 1990 to 1998 for the Weddell Sea. The data is spatially divided into Arctic and Antarctica. Due to the different measurement methods the presented data varies in resolution and period of time. The data, maps and sea ice analyses of the Arctic and Antarctic available for download are based on the information of the satellite radiometers mentioned below. Measurements of the satellite radiometer AMSR-E range from June 19th, 2002 until September 30th, 2011. On Oct 4, 2011, measurements of AMSR-E stopped. AMSR-E‘s successor AMSR2 was successfully deployed to orbit on May 18th 2012. Since August 1st, 2012 AMSR2 has been sending microwave data from which daily sea ice concentrations are derived. 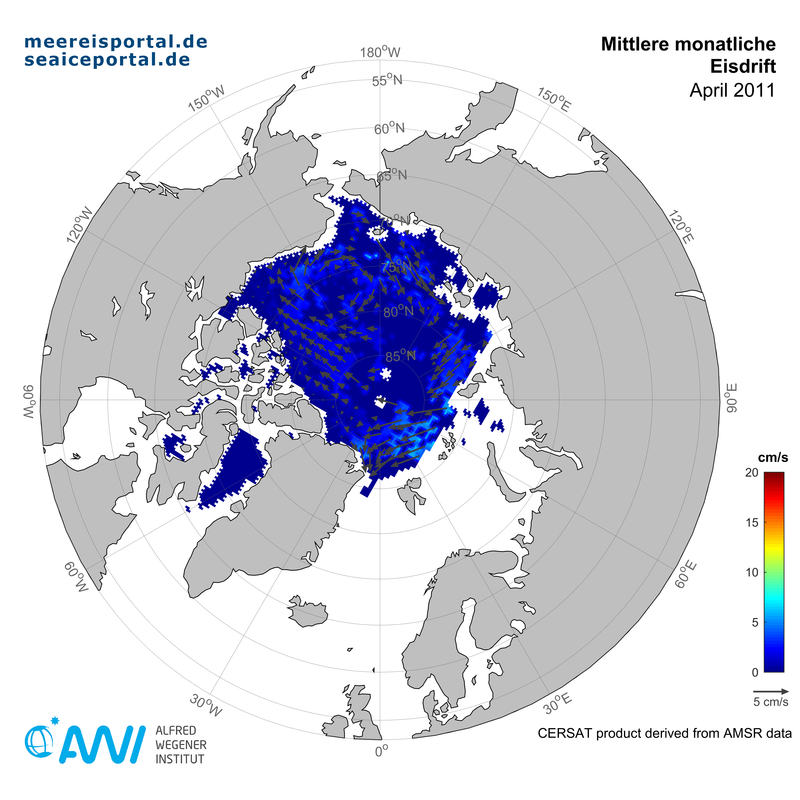 Sea ice concentration based on SSMIS has been available from October 1st, 2011 up to today. Data of AMSR2 is of higher quality than SSMIS data. On meereisportal.de, SSMIS data is therefore only used to fill data gaps of AMSR2. The sensor used to define sea ice concentrations is recorded in the name of the respective daily file. The sea ice concentration data is written in HDF-format. The coordinates and land mask files needed for further processing can be downloaded here and will be needed only once per hemisphere. 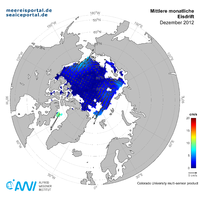 All sea ice concentration data of the Arctic and the Antarctic, including data until June 19th 2002, (HDF-format) from the University of Bremen (Institute of Environmental Physics) can be accessed here. This site includes data sets for Arctic, Antarctic and, in a higher temporal resolution (3.125km), a number of regional maps. They use a polar stereographic projection with equal area at 70° latitude. The geographical coordinates of the pixels are given in separate files are in this file for Arctic and in this file for Antarctica. If there are any questions or difficulties, please do not hesitate to contact info@meereisportal.de. We are pleased to help and steadily improve our offer. Furthermore, downloads of daily updated KMZ files usable for Google Earth depictions are available for the Arctic and Antarctic. Soon, also KMZ- and GeoTIFF-files will be available for download for the entire period via the selection menu. Besides the daily data sets, monthly data sets can be downloaded as well. Development, validation and improvement of the evaluating algorithms were performed in connection with the EU project DAMOCLES (Developing Arctic Modeling and Observing Capabilities for Long-term Environmental Studies). Sea ice extent was determined by direct satellite measurements and the so-called “ARTIST” sea ice algorithm. It has been used and validated in many scientific studies. We assume no liability for any of the provided data available for downloaded. Sea ice concentration is represented in the maps by a uniform color scale: White represents a sea ice concentration of 100%, dark blue marks the regions with the lowest sea ice concentration. According to standard definition , sea ice extent is the continuous area for which a sea ice concentration of at least 15 % is measured. For over 30 years sea ice coverage has been determined based on satellite data. It is normally defined by the sea ice extent, sea ice area in square meters and sea ice concentration (more information here). The data portal provides time series of the monthly mean of sea ice extent and area in the Arctic and Antarctica for January to December since 1979. Moreover, the anomalies of the monthly mean of the sea ice extent in relation to the long-term mean are available for January to December from 1981 to 2010. 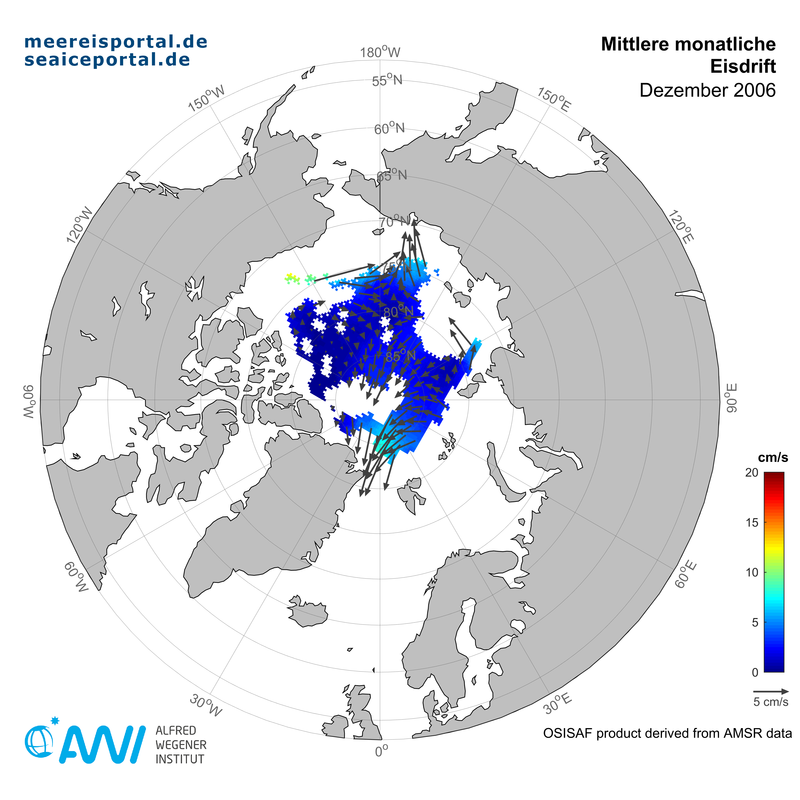 Data of sea ice thickness is derived from the CryoSat-2, satellite of the European Space Agency (ESA). Launched in 2010, the polar-orbiting CryoSat was developed to measure thickness variations of polar ice masses, including glaciers and the great inland ice sheets of Greenland and Antarctica. Currently, changes are especially apparent in the Arctic sea ice. Thus, a major aim of the CryoSat mission is the determination of Arctic sea ice thickness. It is being planned to offer comparable data for the Antarctic. With the CryoSat-2 radiometer the small portion of the ice/snow cover above the sea surface (surface elevation or freeboard) is measured and then transformed into ice thickness based on a several assumptions. 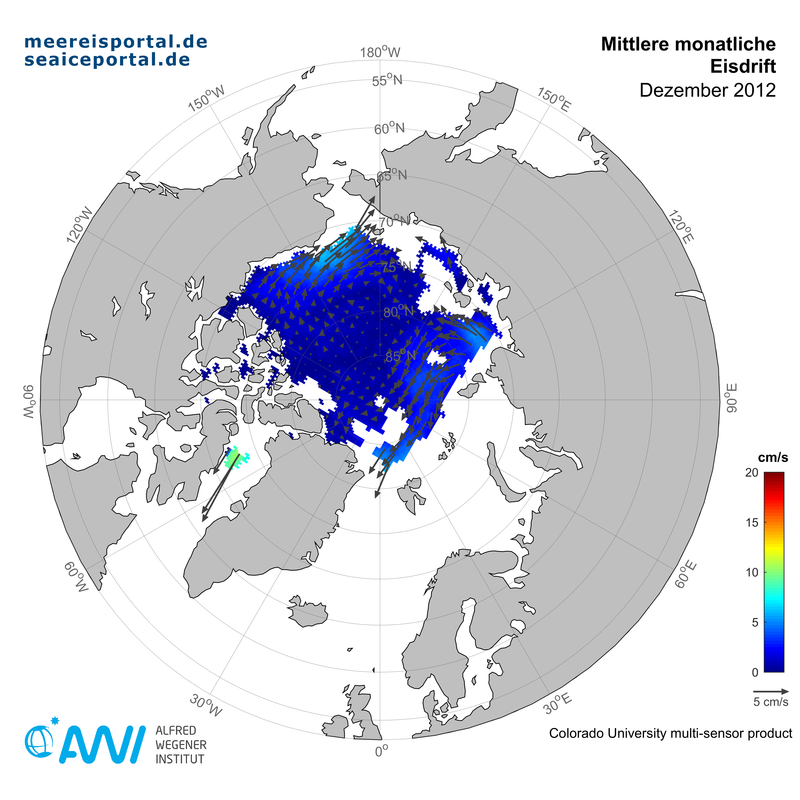 The Alfred Wegener Institute, Helmholtz Centre for Polar and Marine Research works together with ESA in a collaborative project on the accuracy of the sea ice thickness data. 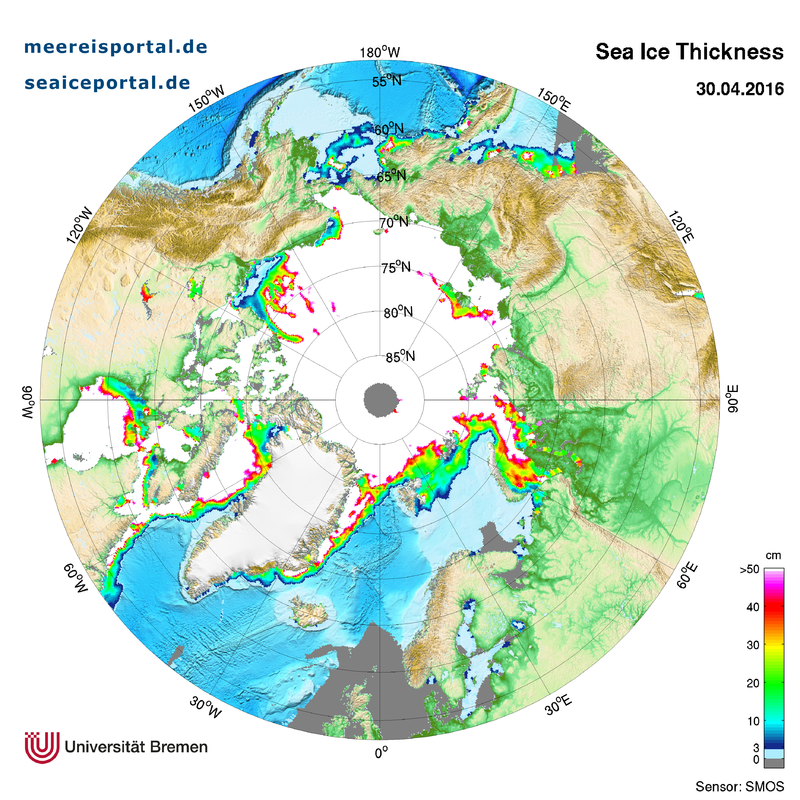 The first freeboard and sea ice thickness maps resulting from this project are now available on this website: Deutsches CryoSat Projektbüro. Data sets available for download here are only an outlook on the quality expected in the finalized data (Disclaimer). 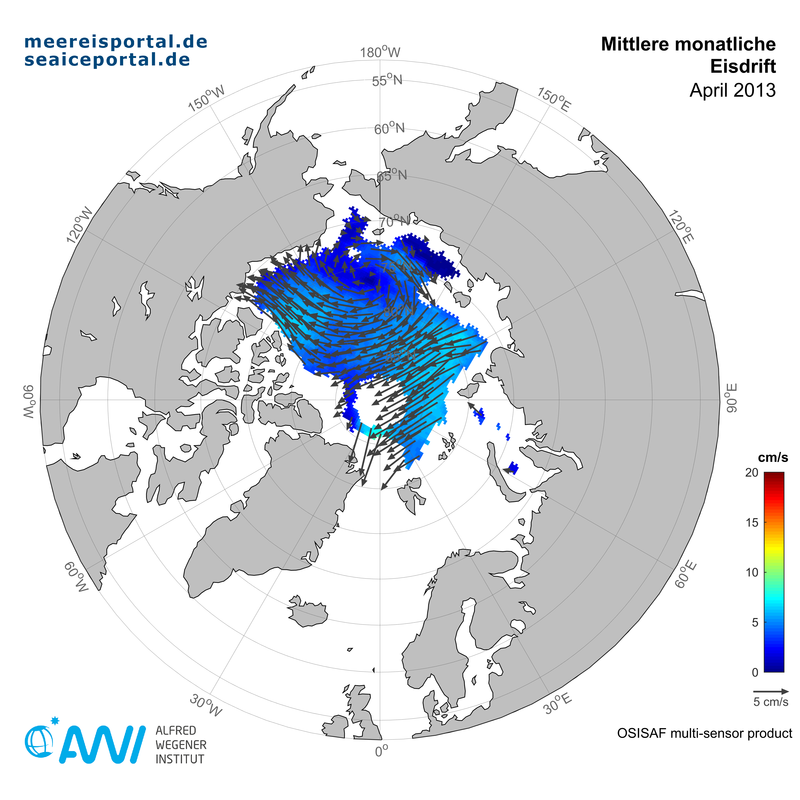 All relevant information about the AWI CryoSat-2 “Sea Ice Thickness Data Product” is summarized in the following document. The thickness of thin sea ice is daily retrieved from observations of the L-band microwave sensor SMOS (Soil Moisture and Ocean Salinity) in the incidence angle range of 40° to 50°, horizontal and vertical polarization. Thin sea ice occurs during the freezing season. In the melting season, the thickness of sea ice is highly variable. In addition, the emissivity properties change due to the wetness of the surface and occurrence of melt ponds in the Arctic. Therefore, thickness data are calculated only during the freezing season, that is from October to April in the Arctic and from March to September in the Antarctic. During the melting season, the procedure does not yield meaningful results. As the resolution of SMOS at the used incidence angle range is about 40 km, only larger regions of thin ice will be retrieved correctly. The rim of thin ice shown in many cases not necessarily indicates thin ice, but can also be caused by the smearing effect (convolution) of the low resolution. This service has been developed in the framework of the EU project SIDARUS. After completion of the SIDARUS project end 2013, the service is continued on a best effort base in the context of the Polar View and of the Arctic Regional Ocean Observing System (Arctic ROOS). For more information visit the website of University of Bremen. Further SMOS data are also available here at Hamburg University. The procedure and validation efforts are described in Huntemann et al. (2014) However, no warranty is given for the data presented on these pages. 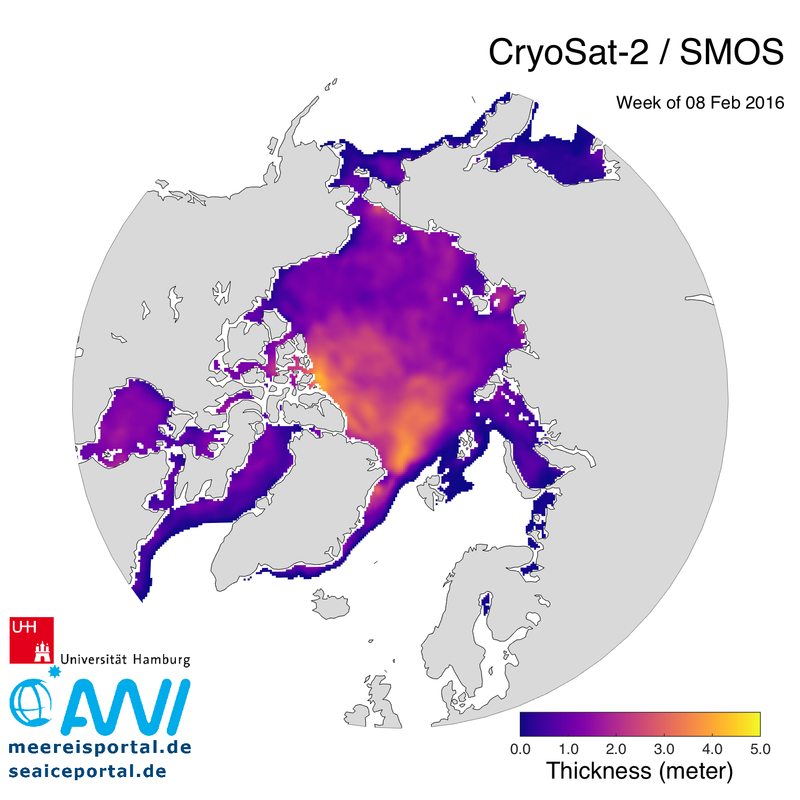 The combination of CryoSat-2 and SMOS data sets can be used to achieve improve sea ice thickness information and the update rate of Arctic wide maps. This is based on the fact that CryoSat-2 is designed for ice thickness retrieval for thicknesses above 1 meter while SMOS delivers accurate thin ice thickness information. The combination of both datasets is based on a statistical approach (optimal interpolation), which merges weekly information from CryoSat-2 from the Alfred Wegener Institute and SMOS from the University of Hamburg based on the respective uncertainties for different thickness classes. The joint product was developed by the University of Hamburg and the Alfred Wegener Institute with the ESA project SMOS+ Sea Ice. Sea ice drift vectors deduced from satellite remote sensing offers valuable opportunities to study the dynamical processes of sea ice and its role in the Arctic climate system. In recent years, a number of sea ice drift products came to be available. The products have different advantages and weaknesses depending on sensors, frequencies, and algorithms used to derive the drift vectors. The temporal coverages are also different due to the different operational period of the satellite-borne sensors. In some cases, users find large differences of the ice drift estimates from different products and hesitate over which product to choose. These differences should be taken into account as uncertainties of the drift vectors of each product. Here we provide uncertainty estimates of respective ice drift products for practical use. What user find on the website? Users can find figures and respective data files in NetCDF-format of the monthly mean sea ice drift of each product and their corresponding uncertainty and bias maps. This site provides uncertainty and bias estimates of monthly mean ice drift vectors from various products in the Arctic Ocean. The original sea ice drift vectors are provided from OSISAF (OSI-405), Ifremer (CERSAT), National Snow and Ice Data Center (Polar Pathfinder Daily 25 km EASE-Grid Sea Ice Motion Vectors, version 2) and Noriaki KIMURA at the National Institute of Polar Research, Japan. The uncertainties of respective products are assessed by high-resolution SAR data provided from Jet Propulsion Laboratory (Kwok et al., (2000)) based on the method described in Sumata et al. (2015). Note that only the two datasets (NSIDC and Kimura) give a full seasonal coverage. For other products summer ice drifts are not available due to limitations of sensor capability and the frequency used. There are additional missing months in some products due to technical problems of the sensors used. The OSI405-b product combines the single-sensor products to take the advantage of the different quality statistics of the different products and to compensate for missing data in each product. The product is continuously updated to exploit available satellite data with different operational periods. The latest version is OSI405c, which provides summer ice drift map as well as winter maps with uncertainty estimates. The OSI405-multi product combines the single-sensor products to take advantage of the different quality statistics of the different products and to compensate for missing data in each product. The merging method of the single-sensor products is described in Lavergne and Eastwood (2010). The OSI405-amsr product is a single-sensor product derived from Advanced Microwave Scanning Radiometer of the Earth Observation System (AMSR-E). A distinctive feature of the product is that a sequence of remotely sensed images is processed by the Continuous Maximum Cross-Correlation (CMCC) method, which builds on the Maximum Cross-Correlation (MCC) method but relies on a continuous optimization step for computing the motion vector (Lavergne et al., 2010). The CERSAT-merged product is obtained from the combination of SSM/I 85GHz H/V brightness temperature maps and QuikSCAT backscatter map. The algorithms used to derive each single-sensor product are the same with that for CERSAT-amsr, and the merging process is described in Girard-Ardhuin et al. (2008). The CERSAT-amsr product is a single-sensor product derived from Advanced Microwave Scanning Radiometer of the Earth Observation System (AMSR-E). The algorithm used to derive CERSAT-amsr ice motion is the MCC method described in Ezraty et al. (2007). The ice motion is estimated from the displacement for 2, 3, and 6 day lags. The 6 day lag is particularly suitable to capture small displacements which cannot be detected by shorter time lags. The Kimura Product provides ice motion data from winter as well as summer. The winter ice drift (from December to April) is calculated from brightness temperature maps of AMSR-E 89 GHz H/V polarization channels, whereas the summer ice drift (from May to November) is obtained from those of 18.7 GHz channels. The algorithm used to deduce ice motions is the improved MCC method described in Kimura and Wakatsuchi (2000, 2004). The NSIDC product are sea-ice motions deduced from a variety of satellite-borne sensors (Advanced Very High Resolution Radiometer (AVHRR), Scanning Multichannel Microwave Radiometer (SMMR), SSM/I and AMSR-E, as well as the International Arctic Buoy Program (IABP) observations and wind effects on motion. Sea-ice motions are obtained from each satellite sensor using the MCC method and merged with the buoy data and winds using the cokriging method. Ezraty, R.; Girard-Ardhuin, F. and Piollé J.-F. (2007), Sea Ice Drift In The Central Arctic Estimated From Seawinds/QuikSCAT Backscatter Maps, User's Manual, Ver. 2.2, Laboratoire d’Océanographie Spatiale artement d’Océanographie Physique et Spatiale IFREMER, Brest, France. Girard-Ardhuin, F.; Ezraty, R.; Croizé-Fillon, D. and Piollé J.-F. (2008), A Sea Ice Drift in the Central Arctic Combining QuikSCAT and SSM/I Sea Ice Drift Data, User's Manual, Version 3.0 , Laboratoire d’Océanographie Spatiale artement d’Océanographie Physique et Spatiale IFREMER, Brest, France. Lavergne, T. and Eastwood, S. (2010), Low Resolution Sea Ice Drift Product User's Manual, GBL LR SID – OSI 405, The EUMETSAT Network of Satellite Application Facilities. Lavergne, T.; Eastwood, S.; Teffah, Z.; Schyberg, H. and Breivik, L.-A. 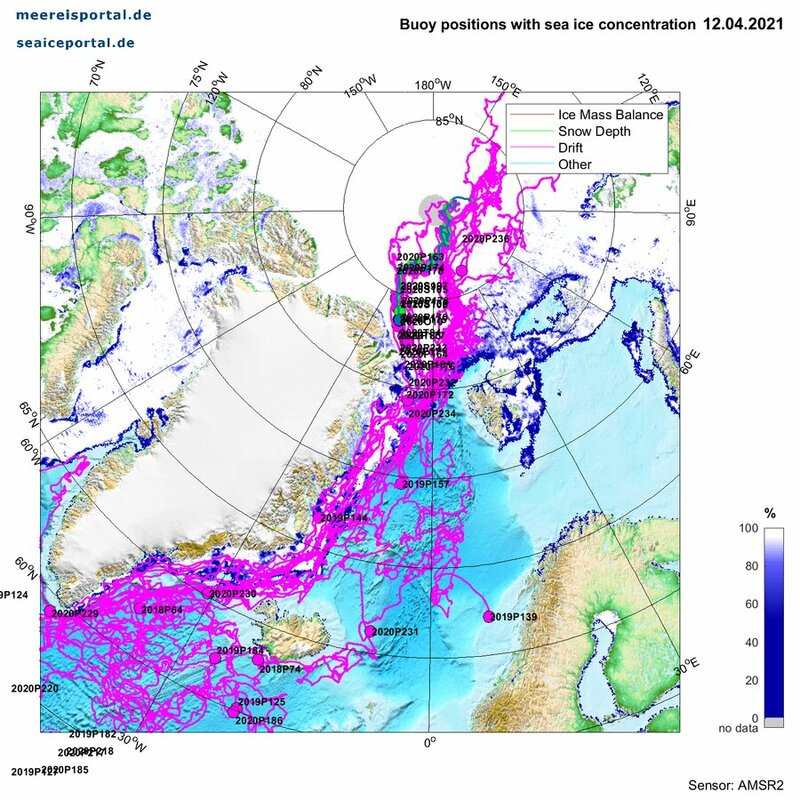 (2010), Sea ice motion from low—Resolution satellite sensors: An alternative method and its validation in the Arctic, Journal of Geophysical Research, 115, C10032, doi:10.1029/2009JC005958. Kimura, N. and M. Wakatsuchi (2000), Relationship between sea-ice motion and geostrophic wind in the Northern Hemisphere, Geophysical Research Letter, 27, 3735–3738, doi:10.1029/2000GL011495. Kimura, N. and M. Wakatsuchi (2004), Increase and decrease of sea ice area in the Sea of Okhotsk: Ice production in coastal polynyas and dynamical thickening in convergence zones, Journal of Geophysical Research, 109, C09S03, doi:10.1029/2003JC001901. Kwok, R.; Cunningham, G. F. and Nguyen D. (2000), Alaska SAR Facility RADARSAT Geophysical Processor System: Production Specification (Version 2.0), JPL D-13448, NASA Jet Propulsion Laboratory, California Institute of Technology, Pasadena, California. Sumata, H.; Gerdes, R.; Kauker,F. and Karcher M. (2015), Empirical error functions for monthly mean Arctic sea-ice drift, Journal of Geophysical Research Oceans, 120, doi:10.1002/2015JC011151. From a certain age onwards there is a snow layer on top of the sea ice. The difficulty to determine its thickness is similar to the measurement of the sea ice thickness. Currently only few long-term data exists that is spatially extensive and collected all year round. Due to the snow’s high capability to reflect solar radiation (albedo) and its low thermal conductivity it is an important component of the superficial energy balance in the Arctic. Satellite measurements and snow buoys collect data for the snow depth on sea ice in the Arctic and Antarctic. On meereisportal.de the data on snow depth is compiled from snow buoys in the Arctic and Antarctica. Furthermore, the monthly means from October to March are available for the Arctic since 2010. They are derived from CryoSat-2 data. Different parameters are used to describe the condition of the sea ice. Measured and derived sea ice data is organized by the different parameters which can be accessed via the upper navigation bar. The different parameters are sea ice concentration and and sea ice extent/area, sea ice thickness, sea ice drift and snow depth. The grouped data is spatially divided into Arctic and Antarctica. Due to the different measurement methods the presented data varies in resolution and period of time. In order to make a comparative statement about the change in the sea ice concentration in different regions for different months and years, the differences of the ice edges are shown on a map. 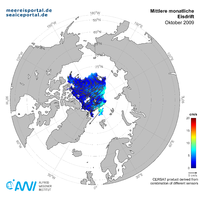 For this purpose, the monthly mean position of the ice edge (15% sea ice concentration) for the respective month of the year can be calculated from the data of the sea ice concentration of the University of Bremen (Institute of Environmental Physics). Differences can then be queried for the long-term average (from 2003 to 2014) or for a monthly mean of the same month of any year. Thus, regions with a sea ice gain (blue) and a sea ice take-off (red) become clearly visible. In addition to the directly measured parameters, there are also derived products, which are important for the description of the condition of the sea ice. The derived sea ice products are therefore provided in this area of the data portal. They can be selected from the top navigation bar. This product is the sea ice edge comparison. The grouped data is divided into Arctic and Antarctica and varies in period of time. How to cite the data derived by the data portal of meereisportal.de? 1) Grosfeld, K.; Treffeisen, R.; Asseng, J.; Bartsch, A.; Bräuer, B.; Fritzsch, B.; Gerdes, R.; Hendricks, S.; Hiller, W.; Heygster, G.; Krumpen, T.; Lemke, P.; Melsheimer, C.; Nicolaus, M.; Ricker, R. and Weigelt, M. (2016), Online sea-ice knowledge and data platform <www.meereisportal.de>, Polarforschung, Bremerhaven, Alfred Wegener Institute for Polar and Marine Research & German Society of Polar Research, 85 (2), 143-155, doi:10.2312/polfor.2016.011. Autonomous sea ice measurements (PARAMETER) from DATE to DATE were obtained from http://www.meereisportal.de (grant: REKLIM-2013-04). 2) refer to the Pangaea DOI, if applicable. Snow buoys: Nicolaus, M.; Hoppmann, M.; Arndt, S.; Hendricks, S.; Katlein, C.; König-Langlo, G.; Nicolaus, A.; Rossmann, L.; Schiller, M.; Schwegmann, S.; Langevin, D.; Bartsch, A. (2017): Snow height and air temperature on sea ice from Snow Buoy measurements. Alfred Wegener Institute, Helmholtz Center for Polar and Marine Research, Bremerhaven, doi:10.1594/PANGAEA.875638. SVP: Nicolaus, M.; Arndt, S.; Hoppmann, M.; Krumpen, T.; Nicolaus, A.; Bartsch, A. (2017): Sea ice drift, surface temperature, and barometric pressure on sea ice from Surface Velocity Profiler measurements. Alfred Wegener Institute, Helmholtz Center for Polar and Marine Research, Bremerhaven, doi:10.1594/PANGAEA.875652. 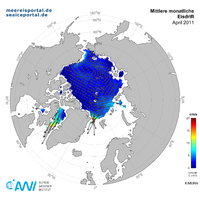 Sea ice concentration data from DATE to DATE were obtained from http://www.meereisportal.de (grant: REKLIM-2013-04). 2) refer to Spreen, G.; Kaleschke, L. and Heygster, G. (2008), Sea ice remote sensing using AMSR-E 89 GHz channels J. Geophys. Res.,vol. 113, C02S03, doi:10.1029/2005JC003384. 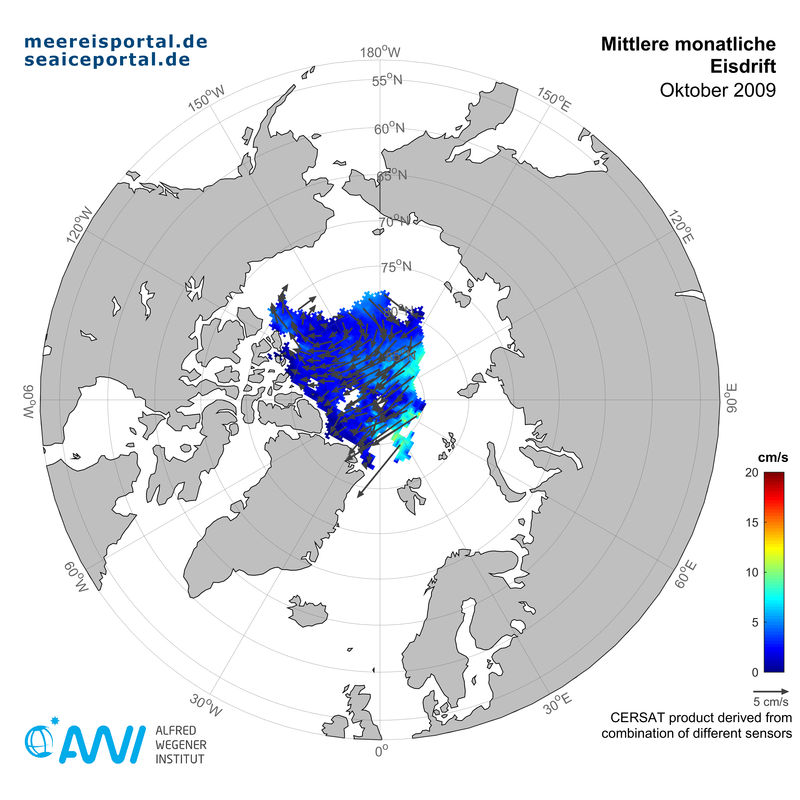 Processing of the CryoSat-2 (PARAMETER) is funded by the German Ministry of Economics Affairs and Energy (grant: 50EE1008) and data from DATE to DATE obtained from http://www.meereisportal.de (grant: REKLIM-2013-04). 2) refer to Ricker, R.; Hendricks, S.; Helm, V.; Skourup, H. and Davidson, M. (2014), Sensitivity of CryoSat-2 Arctic sea-ice freeboard and thickness on radar-waveform interpretation, The Cryosphere, 8 (4), 1607-1622, doi:10.5194/tc-8-1607-2014. Processing of the SMOS Date (PARAMETER) was funded by EU project SIDARUS and data from DATE to DATE obtained from http://www.meereisportal.de (grant: REKLIM-2013-04). 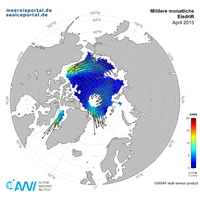 2) refer to Huntemann, M.; Heygster, G.; Kaleschke, L.; Krumpen, T.; Mäkynen, M. and Drusch, M. (2014): Empirical sea ice thickness retrieval during the freeze-up period from SMOS high incident angle observations, The Cryosphere, 8, 439-451, doi:10.5194/tc-8-439-2014. 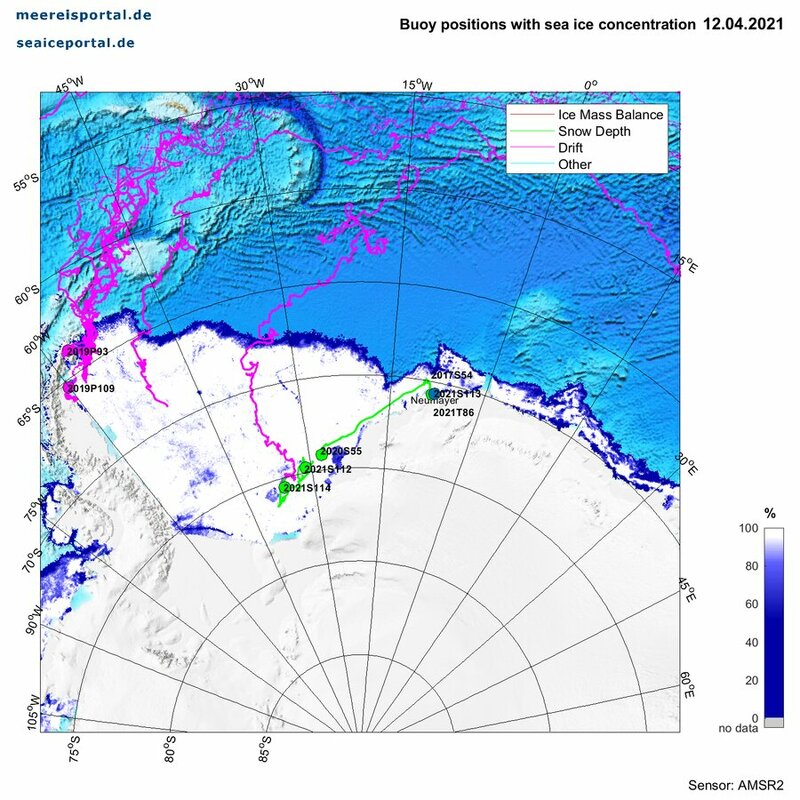 The merging of CryoSat-2 und SMOS data was funded by the ESA project SMOS+ Sea Ice (4000101476/10/NL/CT and 4000112022/14/I-AM) and data from DATE to DATE were obtained from http://www.meereisportal.de (grant: REKLIM-2013-04). 2) refer to: Ricker, R.; Hendricks, S.; Kaleschke, L.; Tian-Kunze, X.; King, J. and Haas, C. (2017), A weekly Arctic sea-ice thickness data record from merged CryoSat-2 and SMOS satellite data, The Cryosphere, 11, 1607-1623, doi:10.5194/tc-11-1607-2017. Lavergne, T.; Eastwood, S.; Teffah, Z.; Schyberg, H.; and Breivik L.-A. (2010), Sea ice motion from low-resolution satellite sensors: An alternative method and its validation in the Arctic, Journal of Geophysical Research, 115, C10032, doi:10.1029/2009JC005958. Girard-Ardhuin, F.; and Ezraty, R. (2012), Enhanced Arctic sea ice drift estimation merging radiometer and scatterometer data, IEEE Transactions on Geoscience and Remote Sensing, 50(7), 2639–2648, doi:10.1109/TGRS.2012.2184124. Fowler, C., J. Maslanik, W. Emery, and M. Tschudi. 2013. Polar Pathfinder Daily 25 km EASE-Grid Sea Ice Motion Vectors. Version 2. (Daily and Mean Gridded Field), NASA DAAC, the National Snow and Ice Data Center, Boulder, Colorado. Kimura, N.; Nishimura, A.; Tanaka, Y. and Yamaguchi, H. (2013), Influence of winter sea ice motion on summer ice cover in the Arctic, Polar Research, 32, 20193, doi:10.3402/polar.v32i0.20193. Sumata, H.; Gerdes, R.; Kauker, R. and Karcher, M. (2015), Empirical error functions for monthly mean Arctic sea-ice drift, Journal Geophysical Research Oceans, 120, doi:10.1002/2015JC011151.